Growing up, my father, two sisters, and I took many road trips to visit relatives for summer vacations. I remember spending long hours in the car reading, singing, playing or just looking out the window as the cornfields went by. Because of these fond memories, I looked forward to having children of my own, packing up, and hitting the road on some adventures. One husband and two children later, I have had a few fun road trips with them, though they don’t quite look as I imagined them to be. For one thing, while my children are avid readers, they expect that on a trip of any length that they will be watching DVDs. As a result, not a lot of scenery watching happens. Also, it occurs to me that perhaps they are not quite as enamored with the journey as the ultimate destination. Packing cars is a specialty of mine that comes from many years’ experience loading my mother’s pickup truck to go to the festivals where we would sell our sheep and wool products. 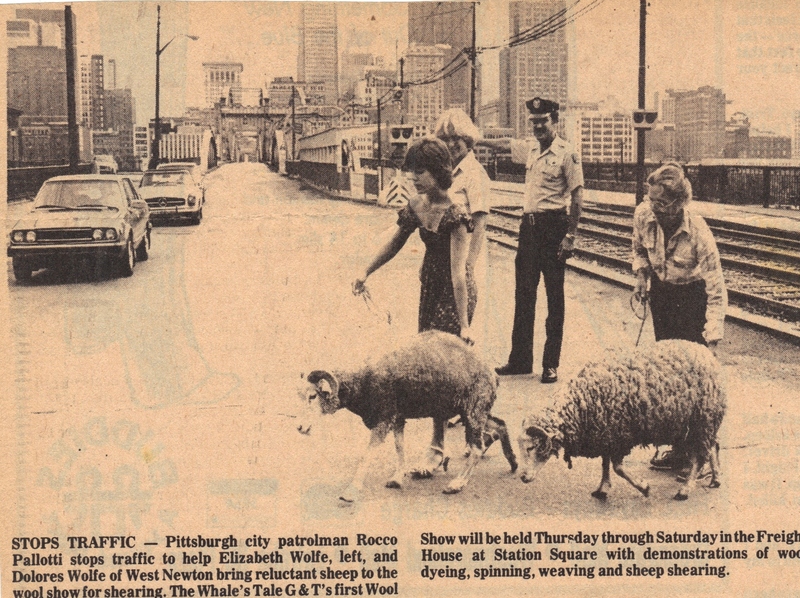 I’ll never forget the time we were in downtown Pittsburgh (an hour’s drive from the farm) after a week-long festival. Each day we brought more items with us, but we only wanted to make one trip home. It was late and we were all tired, and I was bound and determined to fit it all in. I managed to get all the boxes and equipment in, as well as two live sheep (see photo), stuffed in the very back of the truck – their noses just peeking out of the back window. Because of this, packing the car for vacation has become my job. Every time I hear Jon’s voice saying, “It’s never going to fit,” I think of something a friend of mine once told me to say in predictable and frustrating situations: “This is the part where…” So instead of getting angry with him at his lack of confidence in my ability, I say to myself, “This is the part where he says it’s not going to fit, and then I fit it in.” I’ve learned over the years that it’s better to have him leave me alone while I pack in order to avoid his negative energy irritating me. Perhaps you’ve heard the phrase, “They declared it in the face of no evidence.” In the transformational world, this phrase implies that someone manifested their vision even though there was no historical evidence to support them, and that in fact, people said it could not be done. I’ve always been inspired by people who are courageous enough to follow their dreams despite a culture that discourages them based on no evidence. In the absence of evidence, it can be hard to really believe that something can be accomplished. What’s funny to me about this scene that keeps replaying every time we go on vacation is: there IS evidence! I DO fit it in every single time. Like EVERY time! Yet every time, Jon approaches the situation with doubt. Pondering this has led me to wonder – how often do we all, even in the face of evidence, doubt anyway? We keep making people (or ourselves) prove themselves over and over, watching and waiting until they screw up. Sometimes we refuse to believe it even though the evidence is right before us. We either negate the evidence, or call it something other than it is, or think it’s a fluke. Part of making a shift in your experience of the world is to actively and conscientiously collect evidence to support what it is that you want. And once that evidence is before you, to accept it not as a fluke but as the real deal – you manifesting exactly what you wanted.